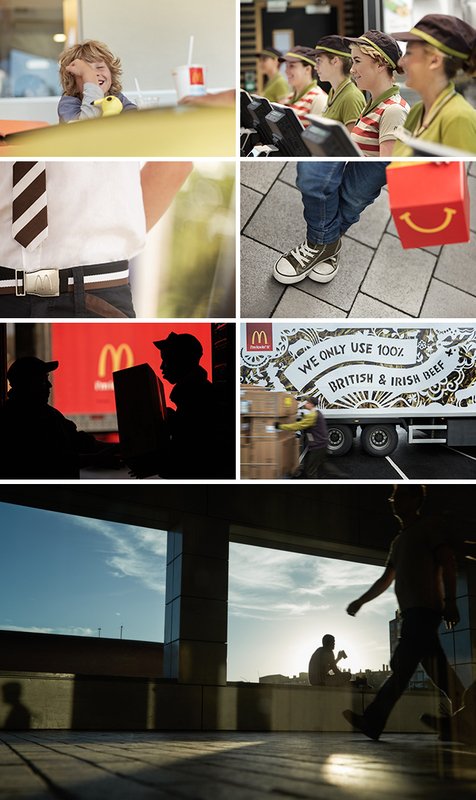 In the previous post "McDonald's | Around the World" we released a sampling of images from our time plane, train, and taxi hopping throughout Europe. On the road for nearly three weeks we set out to capture a day in the life of one of the world's most recognizable brands; showcasing similarities and differences while building a library of still and motion based visuals. After sifting through hours and hours of footage on the film side, editor Nathaniel Schmidt crafted a visual narrative / director's cut that highlights our time traveling amid Germany, Spain, and the United Kingdom. Once again, many talented and creative partners worked together to bring the McDonald's | Europe in Motion piece to life. We hope you enjoy watching as much as we did producing, traveling, shooting, and "lovin it." The era of all things digital seems to be pushing the print portfolio slowly out the door. We put our heads together to revisit the idea of a portfolio; one that retains the tactile beauty of a print portfolio (case, design, and a physical book) as well something that allows seamless integration of the iPad, showcasing the film side of our work. We coordinated some initial meetings to bounce ideas off graphic designer Nathan Strandberg from Eight Hour Day and industrial designer Travis Read, both creatives doing amazing work that we have had the chance to partner with on several occasions in past years. We went through many rounds and incarnations of case designs that could house an iPad for our video content, as well as hold our printed portfolio, business cards and smaller promo samples. You'll see many case designs and the overall evolution presented in the imagery above. From initial concept to final product and every step in between what was the continued inspiration or drive for the project? From the beginning of the Project, I knew that I wanted to make a custom form factor for the case that would address the unique needs of the end user. There are plenty of cool looking cases in the market place, but non of the cases adequately addressed the need for this type of functionality. Understanding the end user was my biggest driver. At first, I went over board with the functionality and didn't focus on the style of the case enough. But as I learned more about the end user's role as a creative director, the style and simplicity became equally important. It took some time to find the balance, but I think we finally found the balance with our final case. What is one part of the final portfolio that really stands out in your mind? The leather band really brings the whole piece together. It creates the necessary color accent, the heat pressed logo is beautifully burned into the material and the integrated card pockets show that its functional and not just wasted material. Was it a challenge to match functionality with the aesthetic of the design? How did you bring these together? It was a challenge, I hate unnecessary accents, we see this all the time on clothing and bags. Every piece on the JCP iPad case is purposeful, minimal and designed to create the right look. It utilizes grey felt and real leather, to give it an authentic look that is on trend. The large flap and pockets neatly organize the system, so that it looks clean and easy for a first time user to open and pull out the contents they need. As an industrial designer, is there anything else you would like to add? I've made a lot of products for retail customers over the years. This was an interesting project, because we were focused on a specific user segment and not trying to make some generic enough for the masses. We conceptualized all kinds of ideas that would never work for mass market, but would be fantastic for a small amount of people. It was also really nice to work with creative people that are in a very different field than hardware development.